The final segment of the Hades Arc is overall mediocre. 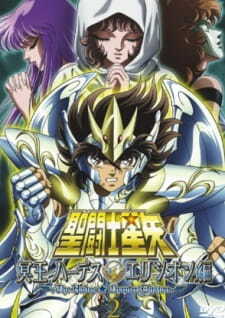 After having Inferno deviate away from the typical formula of the series, the final segment with the battles against Thanatos/Hypnos and Hades is the typical tale of Seiya getting a miraculous power up and the main cast overcoming their foe with the power of friendship, not to mention said climax being rushed and bland. It also doesn't help that it features other cheap plot contrivances such as Pandora's sudden change of heart or Seika suddenly getting over amnesia. One minor thing that disappointed me as well was the lack of the Athena Exclamation. It's introduction in the first act of the arc seemed like it would be foreshadowing for a later use, plus Thanatos being unaffected by it would really push forward the idea of how strong he was. Instead, we get an anime-exclusive scene of the Gold Saints just using their signature attacks. That's not to say I dislike everything about the arc. The arc does a far better job at presenting the power of a God and the sense of tension as well as race against time are far better than in the Poseidon Arc. It was also good to see Athena be more than a damsel in distress and Seiya's fate at the end provided a pretty solid sense of repercussion to the climax (at least until both Next Dimension and Omega ruin this aspect). As for characters, art/animation and sound, there's not much to say. The latter two remain unchanged from Inferno, whilst the characters don't really offer much personal engagement beyond a few highlights such as the reveal of Seika pushing forth Seiya's character arc or the supporting cast such as Marin and Shaina having their moment to shine. The three main villains of Elysion are overall bland in personality and only memorable in design. As a whole, the Hades Arc started off good, but was ultimately disappointing by not being able to avoid some of the series pitfalls. It was definitely better than the Poseidon Arc due to a genuine sense of loss, establishing the power of a God far better and not sticking quite as heavily to the Sanctuary Arc structure, but was still nowhere near the peak of the series and remains average overall. The highlights and it's ending still allow it to be a better final arc than most Battle Shonen can hope to achieve, though that's really not saying much. Even though it's six episodes, the pacing is very even and all the characters are present and united. And during the final battle, there are some cool things that do happen that you have to see to for yourself like with what also happens in the previous oavs. And the ending is also pretty amazing and it's very rare that Shounen uses the ending that it uses, but it is kind of ambiguous, but yet respectfully satisfying. But I feel if you have some familiarity with some of the prior works to Kurumada Masami, specifically Ring ni Kakero, I thought the ending was very fitting to how he does things. The anime demonstrates excellent themes on what it means to be a God and what it truly means to be human thus emphasizing on the value of life. Granted this can be done in just about anything, but I like how it includes the use of Gods of all beings in conveying this, and that even Gods are capable of making errors and falling to the same mistakes of human nature. And overall, most of the Hades oavs have a theme of what defines human nature in relation to sin, and judging people based on them whether man or God. What I also like is how Athena is used in the end. This isn't really a spoiler considering that most of the time, the saints are trying to give her her cloth, meaning her armor. And of course she needs that for combative purposes, and it's nice to see that she has this role for once and has a different kind of use in comparison to how she was mostly used throughout the duration of the franchise. I feel her brief moment really outshines all of that. And I think throughout most of the franchise, her usage was also very faithful to the original mythology of Athena. Thanatos and Hypnos, though their presences iare brief, they did have quite an impact as well by what they had to offer as villains. Even though Thanatos is the weaker and more brash of the twin minions, he does some things that none other villain of Saint Seiya has done which you also have to see to find out. Well, the quality of the animation still retains from the last oav, the explosiveness of the action is still fresh with the new two new villains and their moves are really cool. The designs of the villains are very intimidating with their pale skin tone, dark clothes, and non pupil eyes. The designs of the cloths are well detailed, very shiny, and still appropriately compliments the body frames of the characters and the execution of the action. The design of Hades' armor is excellently detailed with the joints, compliments his figure and gives room for his wild hair, and looks appropriately mobile. Try to combine the rough features of Guts' berserk armor and Griffin's dignified and shininess with his current armor in the Berserk series, but of course black and with some bigger wings, and that's the best way I can describe Hades' get up. And Athena's armor is also excellently animated and brightly colored, and the design accurately reflects the gimmick of the goddess she is inspired by. Another quality that I kept on pointing out is the lighting. In this series, it takes place in a more Heavenly utopia like environment, so the place is filled with flowers and clear skies. The flowers stick out and the lighting in contrast to this just really sticks out to me considering that the villains are the lords of darkness, so I found a very nice ironic twist to that along with what was mostly presented in the previous oavs. So for this nice twist along with another unpredictable twist I appreciated which you also have to see to find out. The new voice cast from the previous oav is also back. And I feel even though this series is shorter, I felt the newer voice actors for Shun, Hyoga and Athena were present enough to have me form my opinion on them. Hyouga's new voice actor is Miura Hiroaki. He actually does a good job of capturing the original performance of Hashimoto Kouichi, though I think his voice is deeper. I think the character lacked any significant dialog or soloquies that really defined the character to really make you evaluate him 100%, but I think he does a good job with what he has to offer. The only voice change that I could ever find justified is of course that of Shiryu since Suzuoki Hirotaka has passed on. His newer voice actor is Sakurai Takahiro, the voice of Cloud from Final Fantasy VII and Suzaku Kururugi from Code Geass. Suzuoki just has this really distinct voice that always brought a unique charisma and authority to his character. Sakurai really tries hard to emulate that performance but it will never compare to how Suzuoki did it. I think the new voice actors are good in their own ways, but they will never compare to the original performances whether they're 16 or 60. As for the music, the background music is still the same from the oavs and TV series so nothing left to comment on that, other than it's still a nice touch in still trying to maintain the overall spirit and identity of the franchise. Megami no Senshi is still the opening theme and I already talked about the awesome qualities that song has in my review of Inferno. But the ending theme, Kami no En, is very impressive. It is one of the few songs that captures the Greek mythology inspiration, as well as the Utopia environment and atmosphere it takes place in, and also does what the Saint Seiya soundtrack does best, talking about the themes of love, hope, and unity. Well, all I can say is you're going to watch one helluva an ending, though it is kind of open ended. But not many authors today are too ballsy in my opinion and the way it ends, it's just awesome. Granted there are some loose ends, but it ends to a point where you know the characters have all developed. I know there is a new installment of Saint Seiya called Next Dimension which is Kurumada's official work. I can't comment much about it yet but I would love to see where Saint Seiya can go from how it ends. I heard Kurumada wanted to make one more story arc, but disputes with publishers and declining sales had to make him end it at this point which is why I think it felt a little open ended, but despite that, it's well concluded since they fought one of the baddest Gods of all time.